The Town Council is pleased to announce that it can now provide a provisional opening date for the Swanage Boat Park of Wednesday 23rd May 2018. Construction work is continuing, and despite delays caused by the weather, is on track to be completed well in time for the opening date. If you do not have access to a computer please ring 01929 766018, or pop in to the Swanage Information Centre and we will be pleased to complete an application for you. After the closing date we will allocate customers to spaces and send out invoices to ensure we receive payment before the opening date. Further details will follow once we have reached this stage. We have just over 70 spaces available, and at the moment 89 expressions of interest. Payments for the boat park will primarily be made online, which will make payment easier for you and the Council. Also of note is that an annual ticket for boat launch only is being considered, which may be of interest to those who wish to use the slipway but not the boat storage facilities. We will also be recruiting two boat park attendants, to start from mid-May 2018. If you are interested in this role, please contact me and I will arrange to send you an application form when they are ready. Swanage Town Council Boat Park is situated off Peveril Point Road. Turn left off Seymer Road and carry on through Broad Road Car Park. Click on the link for a map of the area. Bookings to launch (or store, when the boat park re-opens in 2017) your boat at the boat park can be made by contacting the Swanage Information Centre on 01929 766018. All users of the boat park and slipway must be aware of the boat park regulations. Please take the time to review these. Thank you. 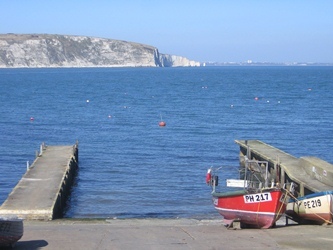 Situated on the foreshore you will find Swanage District Angling Club and also the boat house for Swanage Lifeboat. Both inshore and off shore boats are housed here. For information on the lifeboat, crew and latest news, please visit their website on www.swanagelifeboat.org.uk . Swanage Town Council’s Fisherman’s Huts are also situated on the foreshore. There are 19 huts that local fishermen can rent from the Town Council, enabling them to have ample storage for nets and equipment whilst having easy access to the sea. The huts are numbered from 1 – 20, missing out No. 13 as this is considered unlucky for fishermen! There is currently a waiting list for these huts, if you are a registered fisherman and are interested in going on the list, please contact the Town Hall on 01929 423636 or e-mail admin@swanage.gov.uk.